In the foreboding north, the demonic hordes of the magic-twisted hellscape known as the Worldwound encroach upon the southern kingdoms of Golarion. Their latest escalation embroils a preternaturally handsome and coolly charismatic swindler named Gad, who decides to assemble a team of thieves, cutthroats, and con-men to take the fight into the demon lands and strike directly at the fiendish leader responsible for the latest raids—the demon Yath, the Shimmering Putrescence. Can Gad hold his team together long enough to pull off the ultimate con, or will trouble from within his own organization lead to an untimely end for them all? From gaming legend and popular author Robin D. Laws comes a fantastic new adventure of swords and sorcery, set in the award-winning world of the Pathfinder Roleplaying Game. The Worldwound Gambit is sanctioned for use in Pathfinder Society Organized Play. Its Chronicle sheet and additional rules are a free download (229 KB zip/PDF). I read this as a follow-up to "City of Blood", which shares 1 character (the most awesome Hendregan, the insane fire sorcerer). I will readily admit that this book took me a while to warm up to, but once I did (about a 3rd of the way in? ), it just got better and better. I see some of the reviewers dropped it b/c it didn't grab them early on; for those attempting it in the future, I say give it a chance to mature. For those reviewers who dissed it for (gasp) writing in the present tense...I never even noticed; it was a non-factor in my enjoyment. What I like about most of the PF novels is finding characters and plots that are a little out of the norm. Here, a band of morally-challenged but engaging anti-heroes is a good start. It takes a while to have them all together as a team, but once that happens, I think their interactions and bantering quickly pull you in. As for the story, an audacious con pulled on demons in the Worldwound, well, that's just ballsy. I would love another novel w/ Hendregan. The scene w/ him talking to and negotiating with the demonic lake of lava was just awesome. 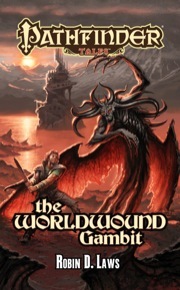 Well, you know from the title that this book involves the Worldwound, which in the official Pathfinder campaign setting of Golarion is a massive tear in the fabric of reality through which demonic armies of the Abyss have invaded and established a foothold. With such a setting, you could expect, and wouldn't be disappointed, to find gore, horror, and demons aplenty. The novel is extremely effective in its depiction of demon-scarred lands, but it's not relentlessly dark. The protagonists, although in a terrible situation, hold enough personality and interest to keep the story flowing. This is one of those books where the reader isn't guaranteed a happy ending--and that makes it all the more exciting to get to the end and see what happens! I think my only real criticism is that the author tries too hard to subvert expectations by having traditional heroes turn out to be foolish, weak, or evil and traditional rogues end up showing all of the virtues of courage, friendship, etc. All in all, this is a good, well-written fantasy story of especial interest to readers who a) like demons or b) like non-traditional heroes. The elevator pitch for this book would be "The gang from Ocean's 11 have a heist planned in Sauron's tower from Lord of the Rings." After a demon attack on Mendev kills a long-time accomplice, a skilled con man named Gad vows revenge. He assembles a diverse group of criminal types for a potentially deadly mission: he wants to infiltrate the Tower of Yath, a major new presence in the Worldwound, and steal the mystical orb that allows it to exist, thus dealing a heavy blow to the demons' plans. One of the strong points of the book is characterization, as each of the team members have distinct personalities and skills. 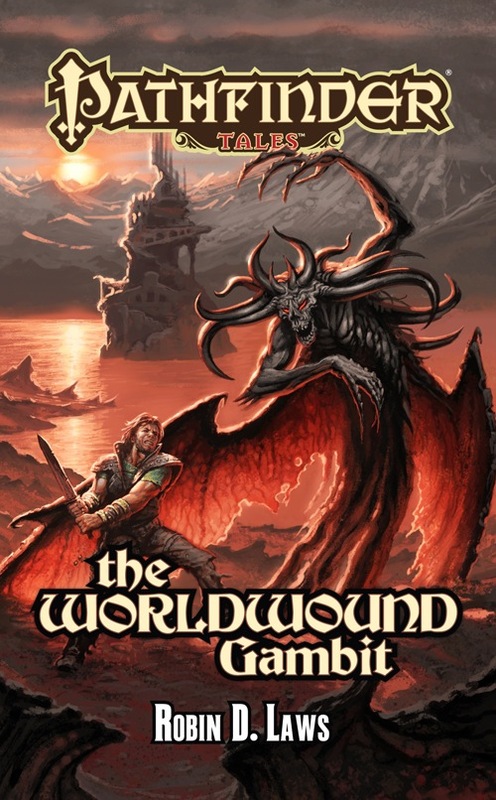 In addition, Robin Laws does a fantastic job with the setting: the Worldwound definitely feels like no place else on Golarion, and is definitely not the place an adventuring party wants to visit! A surprisingly long chunk of the book takes place within the tower itself, and those scenes are fraught with tension and surprises. The weaknesses of the book, in my mind, are twofold and relate to what I wrote about above. First, the author really goes out of his way to make the paladins and crusaders fighting against the tide of demons seem like arrogant, simple-minded idiots destined to fail. Second, there's not enough motivation provided for why Gad (and especially the others) decide to undertake this mission when there is almost no chance of profit. I get that revenge can be a powerful motivator, but we don't even get any backstory to explain why/if Gad and his dead friend were so close, or why all of the team members that Gad recruits would undertake what is portrayed as a near suicidal mission to help him get revenge against a fairly abstract enemy. In general, I think the idea of subverting fantasy tropes by having a group of rogues sneak and bluff their way into the tower instead of knights fighting their way in is great; it just seemed like some depth to the story was missing to make the character's actions plausible. This is written almost like a screenplay. Present tense, no exposition, no thoughts or mind-reading of the characters, no background presented. If you haven't read anything like this before, it can be difficult to get used to. The first chapter is probably the worst, just a setup for "this guy is a con artist" and it's almost worth skipping. Which is too bad since the worst chapter is your first experience of the book. I stopped and started a few times until I got through it. The rest of the book is a lot better than that first chapter. After awhile you get used to the present tense writing, and the fact that it does not delve too much into the thoughts of the characters make you feel like you are there with them, not knowing what they are thinking or why, but you learn about the characters as you go along. This requires a little more thinking on the part of the reader. In the end, it is a good, Ocean's 11 type story about a team of thieves and con-artists who team up to fight evil, so they can get back to thieving without having to worry about their targets being killed off or destroyed. If you've ever wondered how to make a good campaign featuring nearly-evil heroes, this is it. And the Paladins are a great bunch, just what you expect them to be. Except for some near the end who are actually pretty good. In addition you get to see some characters from other books pop in and see what has happened to them since the last book featuring the WorldWound. Love the location of this books story. Southern as in the nations south of it... from the Worldwound, most of Avistan is to the south. Oceans Eleven + Worldwound = Sold! I assume this cover is a mock up? Because I’m really wondering what an osyluth is doing hanging about the Worldwound! Ah - my illiteracy strikes again. Isn't 978-1-60125-287-6 the ISBN for Prince of Wolves? When will we get a book set in Cheliax? Correct. We will replace it with the real cover once said cover has been painted and is in our clutches. I'm a little worn out with Cheliax stuff by now, I feel that I know more about Cheliax than I do about any other part of Golarion except Varisia. What I'd really like to see is a book set in Taldor. I'm not normally fan of this kind of products, but that still looks like a really good buy. I've got a quick question for the guys in charge: have you already sold the translation rights for the Tales line, somewhere in the world? What about Italy? We are working on the framework of licensing translated versions of the Pathfinder Tales novels presently. Serious parties should inquire with Jeff Alvarez, who coordinates our foreign language licenses. You can email him at jeff.alvarez@paizo.com. Me too. Waiting with anticipation. Books based in the Golarion setting, love it! Well I am about half way through the book so far. I like it all and all, but something about it just seemed... different. It took me awhile to realize what that is. Now I think I know. It reads a lot like a campaign, on how they are played out. The pacing changes speed from time to time and different things fade to black and jump forward. Not a bad style just different is all. I do really like that it is a party aspect though. I do hope we see more such books from paizo in the future. I had the same issue with the previous book. Like Dark Mistress said, not a bad style, but different. I'm working through the current Silverburg Planet Stories book (as if my real work was that easy) and looking forward to reading this new offering. I was thinking that as I read it. Great book. I'll definitely be giving this one a look, though I'll admit to being somewhat put off by what I've been hearing about it being written in present tense. I'm sure the story is great, but that particular style (if the current web fiction by the same author is any indication) is rather jarring to me. I have started reading this book and I have to say that I don't know how it got past an editors desk. It reads like it was written by a junior high student. When I saw that James Sutter had allowed Robin D. Laws to write The Worldwound Gambit in present tense, I did a dance of joy. Robin expresses why freedom of style makes a difference in an excellent guest post at my blog. Please take a look post your thoughts there, here, or anywhere. Don't forget to check out the links to Robin's various upcoming projects and his regular blog. A more erudite and useful site on gaming and narrative you will rarely find. I should have written, "When I saw Robin had written the book in present tense." I knew James was open to all kinds of stylistic choices from the very start. "Hell's Pawns" is in present tense, and I briefly considered that for Prince of Wolves but soon realized what worked for Radovan's voice wasn't so good for Varian's. What's important is that you choose the style for the story and the characters. I finished the book about a week ago and thoroughly enjoyed it. Thank you Robin Laws and Paizo! Many thanks for a great story!! This was a great read. I've posted my review here, at amazon.com, and on my blog. I concur with Dave. I appreciate the time and talent Paris put into that review. I finished this earlier today, and had not trouble with the writing style. Excellent story full of interesting characters.